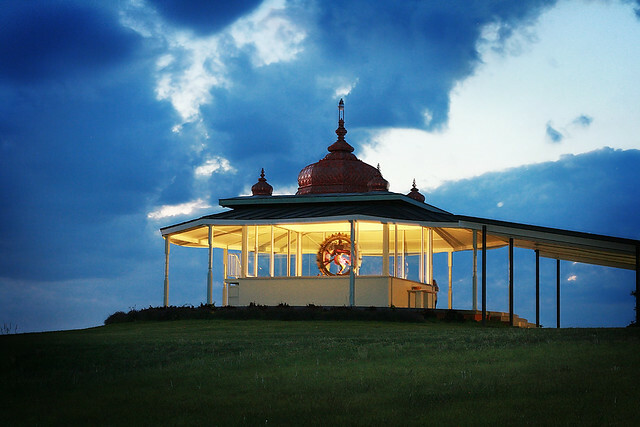 Swami Satchidananda and Yogaville residents were joined by eminent guests, from around the world, to celebrate the dedication of the Lord Nataraja Shrine at Satchidananda Ashram in Virginia. The shrine is situated atop Kailash, a high hill named after the sacred mountain of Lord Siva in Nepal. Siva Nataraja, the King of Cosmic Dance, dances within a flaming halo symbolizing the Pranava OM. On His right ear is a man’s earring and on the left ear is a woman’s earring, showing that He is both male and female. The cobras that coil around the hair and body represent the cosmic force of Siva, the Supreme Yogi. The magnificent 7-foot bronze Nataraja, was donated by Dr. Karan Singh (former Indian ambassador to the USA) and his wife Princess Yasho. Both Dr. and Mrs. Singh were present for the dedication ceremonies.